Made of environmental wood, very light, nor easy to bend. Can be applied in many occasions, Perfect for school, office, home using. Wood color with black number, nor easy to fade. Standard: Inch scale,1/16 inch standard, 12 inches long total. Metric scale: 1mm standard, 30 cm long total. Material: Made of hard wood, very light and easy to carry. Smooth surface, clear scale can be read easily. 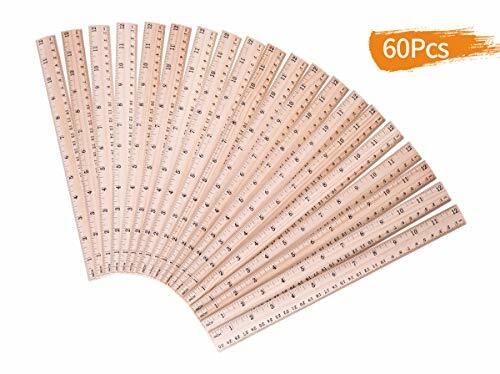 Large quantities: 60 pieces of wood rulers in a set, satisfy your use of various occasions. Ruler with 2 scales: One side is metric scale(30cm), opposite side is inch scale(12 inches, both inches and centimeters for conversion. Inch scale,1/16 inch standard, 12 inches long total. Metric scale: 1mm standard, 30 cm long total. The scale of the ruler is very clear and accurate, will be helpful you in measuring your items accurately. If you have any questions about this product by Salare, contact us by completing and submitting the form below. If you are looking for a specif part number, please include it with your message.